ST. GEORGE — Every year, one of every five college students is sexually assaulted or raped. 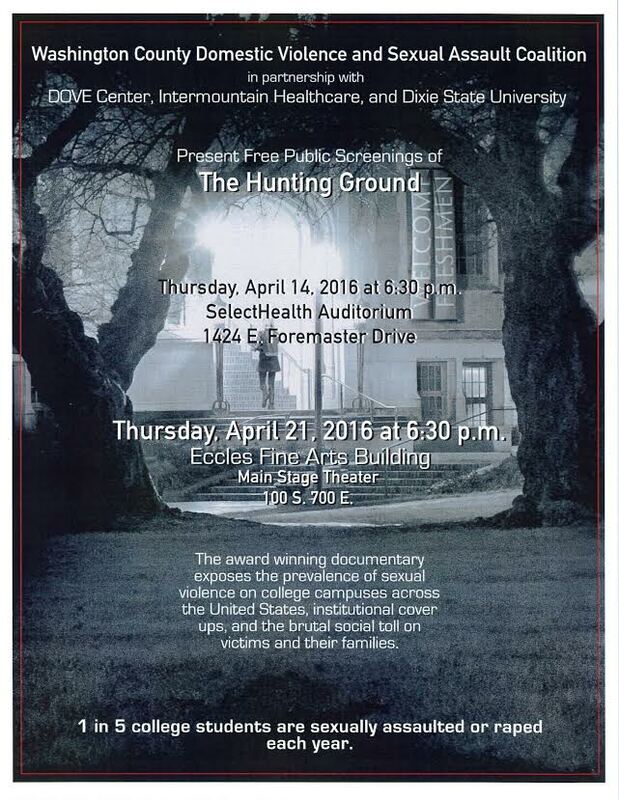 To raise awareness of this issue, the Washington County Domestic Violence and Sexual Assault Coalition in partnership with the DOVE Center, Intermountain Healthcare and Dixie State University are presenting free public screenings of “The Hunting Ground” on Thursday, April 14, at the SelectHealth Auditorium and Thursday April 21, in the Eccles Fine Arts Building Main Stage Theater. “The Hunting Ground” is an award-winning documentary that exposes the prevalence of sexual violence on college campuses across the United States, institutional cover ups and the brutal social toll on victims and their families.